In 1900 Alexander M. Chalmers deeded the present site of the West Sound Community Hall to the West Sound Hall Company with the stipulation that the "... property be used for a site of a Public Hall...". 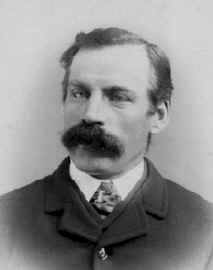 Mr. Chalmers was born in Aberdeen, Scotland in 1835. He was captain of a sailing ship for many years. 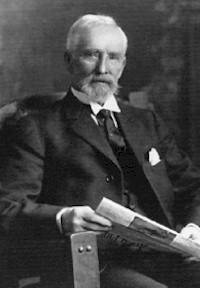 He moved to Orcas Island from Liverpool, England in 1893 and became a U.S. citizen in 1898. He died in 1912 in Bellingham. 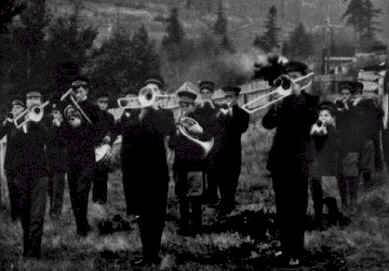 In 1902 the owner of the West Sound Store, George Adkins, donated building materials to the West Sound Hall Company so construction of the West Sound Community Hall could begin. Mr. Adkins, his sons, and other members of the community joined together to build the Hall. In this 1910 photo looking east from the corner of Deer Harbor and Crow Valley roads the WestSound Community Hall is the second building on the left. 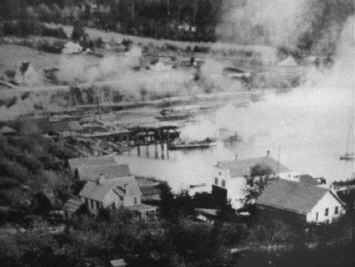 The building on the right is the West Sound Store which was on the road end of a dock near the location of the present county dock. 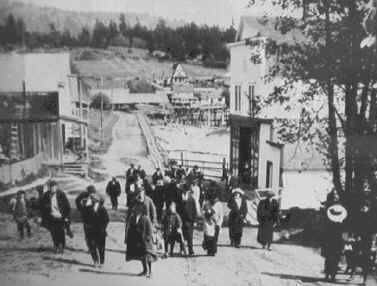 This 1910 photo looking east shows the West Sound Community Hall behind the house in the left foreground. The Chase Brothers mill in the background was destroyed by fire in 1922. 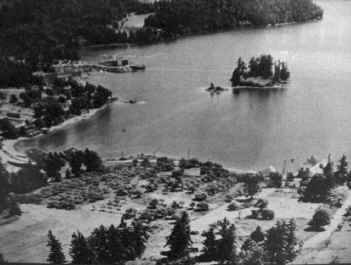 In this 1937 photo looking south, the West Sound Community Hall is on the shoreline below Picnic Island. The apple orchard to the left of the Hall is the present site of the Orcas Island Yacht Club picnic shelter. Many of the trees in this orchard remain and are still bearing fruit.